On a hot August weekend in 1976, a group of men approached the 7-foot-high chain-link fence behind the Danvers National Guard Armory and cut their way through. They reached the side of the armory, and then snipped the telephone wires, preventing any security alarm from being sent out. The intruders picked the lock of the back door, knocked out the burglar alarm to prevent noise, and found their way to the gun vault. The vault posed the greatest challenge. It was made of reinforced concrete with a steel door and combination lock. Cracking the lock combination would take too long, so they worked to crack the vault itself. The men took out pickaxes and whanged on the steel door, over and over, for more than an hour. At one point they took a break and turned their tools on a Coca-Cola machine to get a free drink. Refreshed, they continued banging on the vault, and eventually it gave way. An unmarked van drove around the back of the hotel next door – what is today the Best Western. The driver turned the lights off and pulled up to the cut chain-link fence. The intruders came out with armfuls of weapons that they hurried into the van, while armed guards squatted in the tall grass as lookouts. Once loaded, the van and the robbers drove away, turned onto Rt. 1 south, and disappeared. They were never caught. An armory employee came into work on Monday morning and discovered the robbery, which occurred sometime over the preceding weekend. Among the trove of weapons taken were 92 M16 rifles, 7 large M60 belt-fed machine guns, a .45 caliber pistol, two grenade launchers, several flak jackets, infrared binoculars, and a “Redeye” missile launcher. It was enough to outfit a small army. Originally, Federal authorities noted that the firing pins for the weapons were not taken by the robbers, and therefore declared the guns “useless.” As a precaution, the firing pins were stored separately at Danvers Police Station. But, the guns were far from useless. About two years later, British authorities discovered that some or most of the weapons were in the hands of the Irish Republican Army (IRA), a guerrilla group fighting in Northern Ireland. Most of Ireland became independent from the United Kingdom in the 1920s but part of the north of the country remained in the UK, where there was a split between the Irish Catholics who wanted an independent Ireland and the predominantly-Protestant British Unionists, who wanted to remain part of the UK. Beginning in the late 1960s the Irish community staged civil rights protests, modeled after those of African-Americans in the United States, seeking both equal rights and Irish reunification. This political movement sought to unite Ireland by ballot, while the IRA guerilla operatives fought to reunite Ireland by bullet. 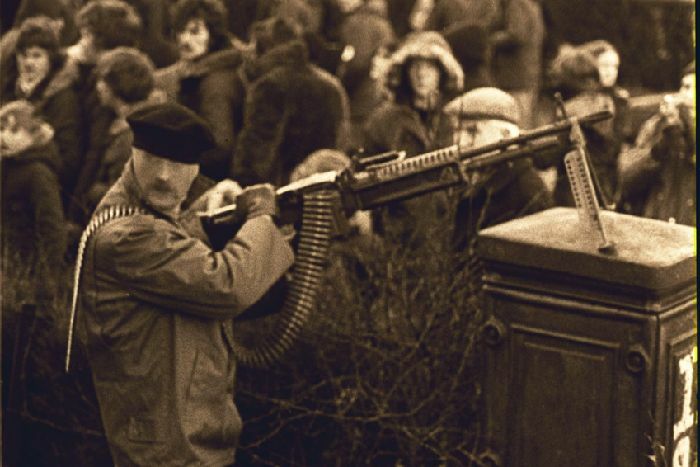 After several incidents of British paratroopers killing unarmed protesters, the IRA’s membership grew and they sought weapons abroad. These large weapons were first used in 1978, when British soldiers on patrol were fired upon. Later that year, the British Army recovered two M60s from the IRA that came from the Danvers Armory. More of the weapons surfaced in 1979 during a roadside bomb ambush that killed 18 British soldiers – the single deadliest incident of the conflict. The IRA also claimed that it used a Danvers M60 machine gun to shoot down a British Army helicopter. The story returned to Massachusetts in April, 1980 when firefighters in Walpole responded to a house fire. They entered an empty house and found a burning chair next to two barrels full of M16s. It appeared as though the fire was deliberately set to destroy the weapons. The FBI and the ATF recovered 46 M16s, and later the owner of the house, Charles A. Gallant Jr., was arrested and charged with possessing the stolen weapons from the Danvers Armory, though he was not involved in the robbery itself. No one was ever charged with the break-in at the Danvers Armory, and it remains an unsolved crime. It had deadly effects, with the Danvers guns attributed to at least 10 deaths and 19 wounded in Northern Ireland.